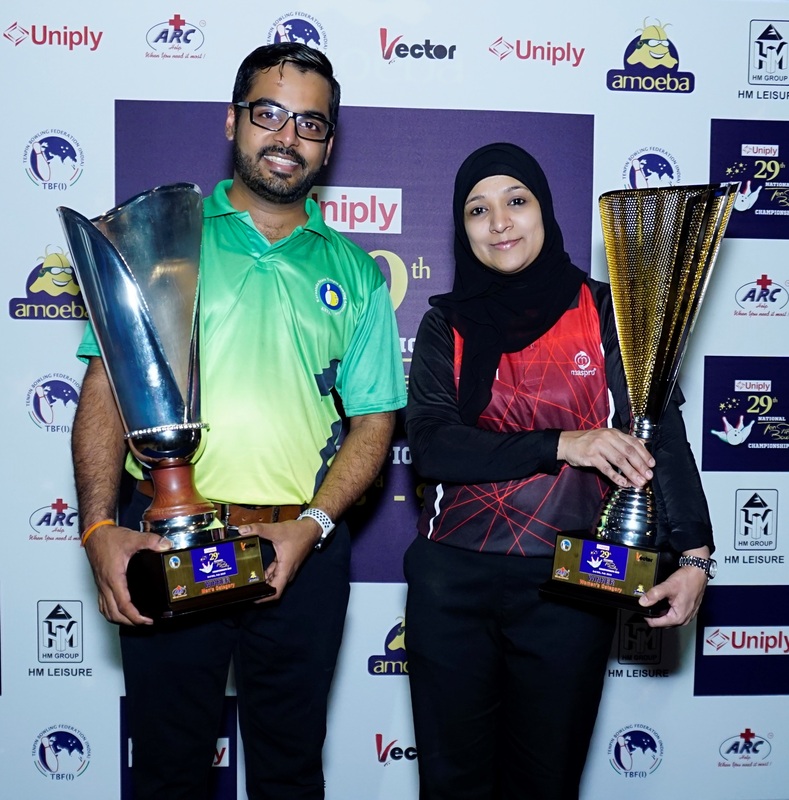 Akaash Ashok Kumar of Karnataka & Sabeena Athica of TamilNadu won National titles at the Uniply 29th National Tenpin Bowling Championships, which concluded at Amoeba, Church Street, Bangalore. In Men’s category, Akaash Ashok Kumar (KAR) won his maiden National title defeating 2nd seed Dhruv Sarda of Delhi (413 – 372) by 41 pins. In the Women’s category top-seed Sabeena Athica (TN) won her 10th National Title defeating Sumathi Nallabantu of Telangana (378 –266) by 112 pins. Earlier in the day, in the stepladder round, played based on cumulative pinfall of two games, in Match 1 of Men’s category, 3rd placed Prathyek Satya (KAR) lost to 4th placed Kishan R (KAR) (426 – 377) by 49 pins. In Match 2, Dhurv Sarda (DEL) beat Kishan R (KAR) (438 – 406) by 32 pins. Dhruv was leading by narrow margin of 6 pins (210 – 204) at the end of Game 1 and he scored to 228 in Game 2 as against 202 of Kishan R to gain lead of 36 pins and moved to Finals. In Match 1 of the stepladder round of Women’s category, 2nd placed Sumathi Nallabantu of Telangana comfortably beat Defending Champion Anukriti Bishnoi of Haryana (355 - 317) by 38 pins to move to finals against Sabeena of TamilNadu. In the Men’s category, Akaash Ashok Kumar of Karnataka (6608 pinfall & 206.50 average) finished at the top position after 32 games, followed by Dhruv Sarda of Delhi (6554 pinfall & 204.81 average), Prathyek Satya of Karnataka (6547 pinfall & 204.59 average) & Kishan R of Karnatka (6479 pinfall & 202.47 average) in 2nd, 3rd and 4th positions respectively and qualified for the stepladder round earlier. 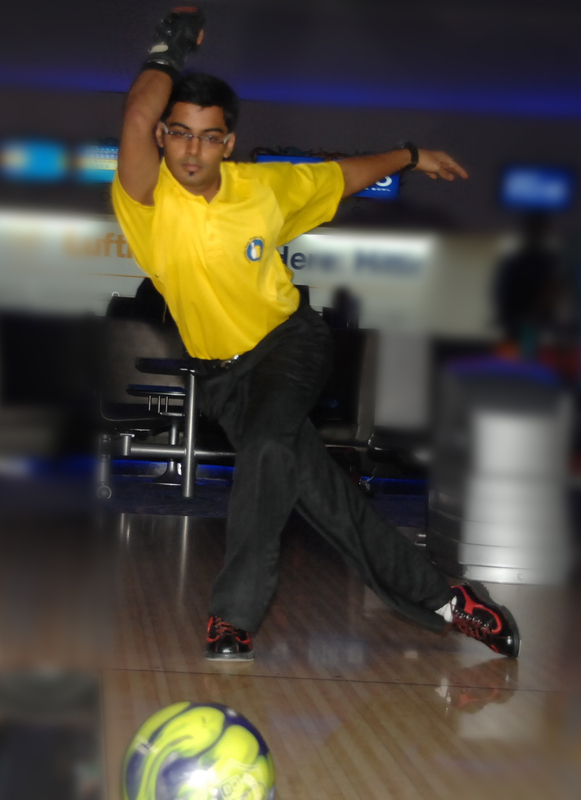 Defending Champion Shabbir Dhankot (TN) missed the cut by 4 pins and finished in 5th position. In Women’s category Sabeena Athica (TN) finished at the top spot (3842 pins at 192.10 average) after 20 games after Round 2, followed by Sumathi Nallabantu of Telangana (3503 pinfall & 175.15 average) & Anukriti Bishnoi of Haryana (3442 pinfall and 172.10 average) at 2nd and 3rd positions respectively. Highlight of the Day is two perfect games (300) on the same day by Kishan R (KAR) and Dhruv Sarda (DEL). Kishan R (KAR) is the first bowler to score perfect game in the history of this Championships and he was then followed by Dhruv Sarda of Delhi. Karnataka State Champion Akaash Ashok Kumar continued to maintain lead at the end of first Block of 6 Games in Round 1 of Uniply 29th National Tenpin Bowling Championships, currently underway at Amoeba, Church Street, Bangalore. 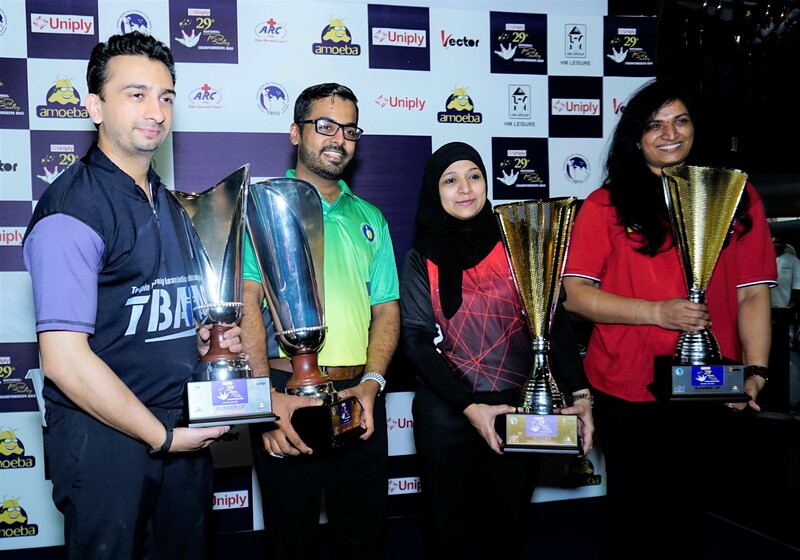 Akaash Ashok Kumar (1330) and Defending Champion Shabbir Dhankot (1272) who finished their first block of 6 games on Monday continued to maintain their top 2 positions. Girish Gaba (1229) and Prathyek Satya (1218) of Karnataka are in Third and Fourth positions respectively, after first block of six games in Round 1. 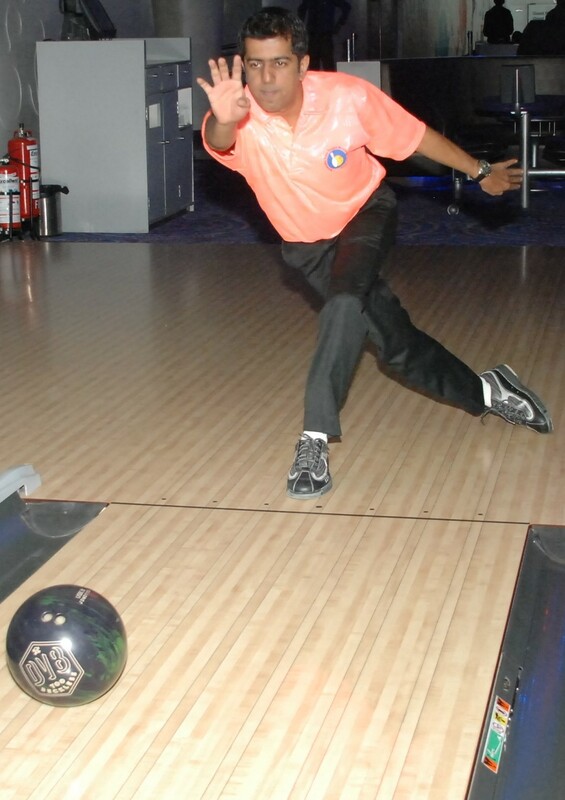 Girish Gaba started the day with scores of 224 and 193 in Game 1 and Game 2. He opened three frames in Game 3 which resulted in low score of 174. He then gained momentum scoring 181 in Game 4 and high games of 212 and 245 in Game 5 and Game 6 and finishing the day with total pinfall of 1229 pins in 6 games. Prathyek Satya started the day with high games of 222 and 214 in Game 1 and Game 2. He lost in momentum in Game 3 scoring only 168. He then played consistently to score 198, 182 and 234 in the next 3 games and finished the day with total pinfall of 1218 in 6 games. Kishan R of Karnataka is in Fifth position with total pinfall of 1200 in the first block of 6 games. Former Champion Dhruv Sarda of Delhi had a poor start scoring 900 in the first 5 games but bounced back with a 258 in Game 6 and finished the day with 1158 pins. He is currently placed in 13th position.